Between my other business A Wool Story and Rosemarine Textiles, I have been a creative small business owner on a consistent basis for the last four years. It's definitely been a journey and a learning process! One of the most inspiring parts of running your own creative business is connecting with other people who are working towards the similar goals of expressing themselves creatively through their work and making a living. I'm excited to continue to share the work of some of my friends and favorite local business owners - what their creative process is like, the day-to-day of running their businesses, and what they're working towards. 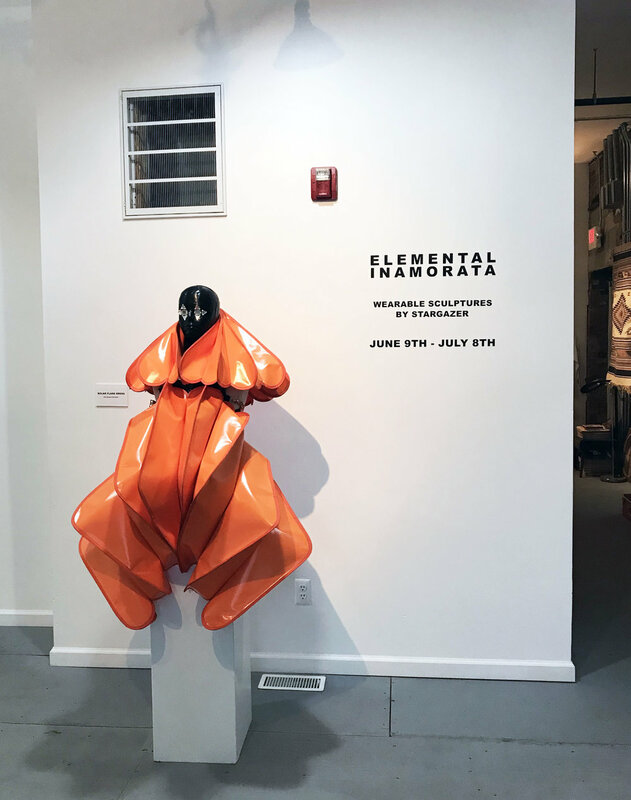 This week I'm chatting with Eileen Lee of the shop and gallery space in Southwest Detroit called Grey Area and the experiential portrait practice called Aura Aura. Eileen Lee and Chris Taylor are the co-owners of the retail gallery space Grey Area and experiential aura portrait practice called Aura Aura. In my other business, Aura Aura, I photograph people and their auras. My goal with this practice is to bring awareness that we have energy that we can potentially change and control. I want to be able to use it as a tool to enlighten people and make them aware that we are all the same and we are all humans and have energy - to help heighten the conscious awareness. What I want people to understand about aura photography is that it's not necessarily only for people interested in new age-y stuff, yoga or reiki energy worker people, but for everyday folks - the goal is to reach the general public who have no previous knowledge of this stuff. Our clients leave with a better understanding of what the photo is and are able to use it as a checkpoint in their life and on their path - but you get them interested with a cool looking colorful picture they see on Instagram or through friends. Do you have business partners or employees? Yes, my boyfriend Chris is my partner. He handles the gallery aspect of Grey Area and I do Aura Aura - although everything is a team effort and we both work together to help each other out. I do the actual aura photography and Chris helps with setup and guest flow to make sure everything runs smoothly. With Grey Area, he handles the scheduling of openings and manages the install process of all the art, stocks the unisex and men's apparel and merchandises the shop. I mainly stock the women's clothing in the shop. We have a few rotating friends who help run out shop for us when we are out of town doing Aura Aura pop-ups including our friend Simone who does the line Eat da Rich. Do you do your business full time?? Yes! I work four days a week in the shop, and when we're not in the shop we are sourcing vintage in our travels or locally. A lot of my time is spent planning and coordinating pop-ups, answering emails, etc. I'm originally from Detroit but I moved to Chicago for 3.5 years after college and then Chris and I moved to LA for 7 years. We moved back home November 2016. I grew up in Rochester and then lived in Royal Oak for a while. Chris is from Canton/Dearborn area. It's our first time living in Detroit proper which was important to us when we decided to come back. tools for capturing an auric photo - hand sensors, aura guidebooks and out-of-print Fuji instant film that Eileen uses for each photo. What does a normal day look like for you?? Typically I get up and make coffee, then I sit on the porch and water the garden. I have to make special food for our dog Rusty - oatmeal with salmon and walnut oil. We'll usually put some records on and hang out while we get ready for the day. We head into the shop around 11:30 and I work on emails before we open at noon. On Thursdays and Fridays we do aura photography by appointment only so it's generally slower those days. On Saturdays and Sundays we have walk-ins so it tends to be busier. What is the biggest lesson you’ve learned about running your own business? When reading an aura photo there are many different colors that may appear based on your current mood, where you are in life, etc. Eileen has curated a general guide of interpreting colors that appear in your aura photo based on a number of aura photo resources as well as her own interpretations from experience. I have learned that working for yourself is harder than working for other people because you end up working all the time! It's nonstop but rewarding because you see that what you're doing at the end of the day is contributing to the bigger picture of what's happening in Detroit and that feels really amazing. What is your favorite part about your work day? I love that I get to work with my partner and the chill out time in the mornings we have together before we begin our work day. What are your goals for Grey Area? We'd love to expand the shop outside of Detroit eventually - maybe into Pittsburgh. We are there often doing pop ups at The Ace Hotel and have really grown to love the city and it's people. It has a similar feeling of being in Detroit. I also really want Grey Area to continue to add to the culture of Detroit and the neighborhood we're in. Many of the spots in Southwest are food-centric and we want to offer new or weird things people may have never seen before through art installations and the shop. What are your favorite places in Detroit? I love POP + Offworld Arcade - it's a great bar with arcade games and pizza. Chris and I love to go there especially on Monday's because pizza is half-off. We also sometimes DJ there on Mondays a well. I also love The Siren Hotel bar - The Candy Bar, Bumbo's in Hamtramck, Rose's Fine Foods, hanging out on Belle Isle and Eastern Market. We're thinking that the space could shift into something else but we're not sure yet. Possibly more of a co-op artist focused space - we're not set on what it should be but open to what it could be. We'd also love to add some community component to Aura Aura. I'd really like to make it more accessible to people who might not have the means to find out about us - to offer people of all walks of life to see themselves in a different way through aura photography - those that have never been exposed to it before. I'm also currently working on a project that will explore what our collective consciousness looks like called Color of Our Energy. I see a lot of red in Detroit and it made me wonder if there's a geographical influence per city - like if each city has a predominant color? It's a crowd sourcing project where people submit their film-based photos to find out if there are trends and patterns of aura colors by location. I'd also love for it to be a resource so those interested in aura photography can find someone local to them, if such a person exists. Whats your favorite thing to do in your free time? When I'm not working I love cooking vegetarian food, Wednesday nights at Bumbo's, going to the Ford Wyoming drive-in and working on self-care through the Many Moon books and other books I'm reading. Thank you so much to Eileen for participating in my interview series! If you're interested in following along with her journey with Grey Area and Aura Aura you can follow her on Instagram here and visit her website here.